When you first bring home a new budgie it may be hard to believe that after a full day on their feet they would prefer to sleep standing up. But, it’s true, a comfortable budgie will grind his beak before going to sleep; then tuck one leg up underneath him and drift off. You may also see your parakeet turn his head around and rest it on his back. Here are some typically preferred sleeping arrangements for budgies. Your budgie will probably not want to sleep in a soft enclosure like a Happy Hut , which is good, because they can be unsafe for several reasons. But, even a safe option like this Sea Grass Snuggle Hut may be regarded as quite unsuitable for sleeping, even if it’s fun for day time play and chewing. If you are concerned about your budgie getting cold in winter time, you can use a Bird Cage Cover if your parakeets will tolerate it, mine don’t care for being covered at all! Otherwise, you can use heated perches, like the K&H Thermo Perch or the K&H Snuggle Up Bird Warmer . What the parakeet does want, in most cases, is to sleep on the highest perch possible. Or rather, the highest thing in the cage, no matter if it’s a perch or the top of a toy. If there’s nothing at a suitable height they will even cling to the bars of the cage in an upper corner. If your parakeet sleeps that way, try putting a perch in that space and see if he’ll get off the wall, although please don’t attempt that after bedtime! Toby used to run through her options every night before bed and would try to sleep on top of several very unstable toys, until we dropped them all lower than the sleeping perch using Plastic Chain . If you have multiple parakeets make sure you have enough high up perch space to help avoid fighting over preferred territory. 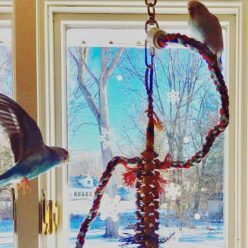 Some parakeets prefer to sleep on a Perch Swing , so you can try offering that as well. I wonder if the movement is soothing, like being on a gently swaying tree branch. Make sure you also have a couple of Night Lights or even a Small Lamp to help avoid night terrors. 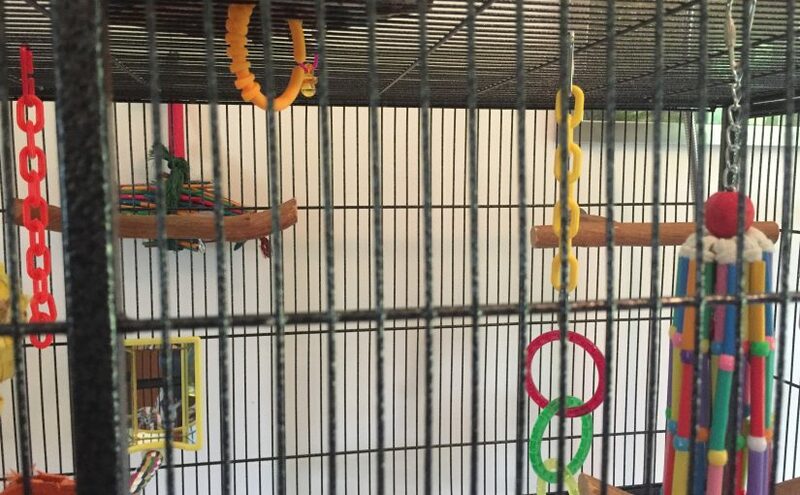 If you’re providing comfortable perches as the highest items in the cage, and eliminating drafts and scary dark spaces your parakeets should be great sleepers! Although there are exceptions to every rule, most parakeets are very comfortable sleeping standing up and resting one foot at a time by tucking it up into their tummies. My budgies (2 of them) usually sleep together in their cage. However tonight the female budgie is sleeping on a lower perch alone??? Any ideas why? Mine do that occasionally, they will sleep for many months in a set position and then randomly switch. Could be they went to sleep annoyed at each other, could be one of them wasn’t feeling so hot (molting maybe) and felt safer being lower in the cage. As long as she is acting okay otherwise I wouldn’t worry too much. Thanks so much! They slept side by side last night. I think they had a “tiff” the other night or maybe the female wan’t feeling so good. Her head was bobbing up and down. You are right, they are fine now. Next Next post: Molting Toby takes a good bath – finally!